Commscope universal tower leg stand-off face bracket. Heavy galvanized steel. Works with any tower leg from 3/4" to 2" diameter. 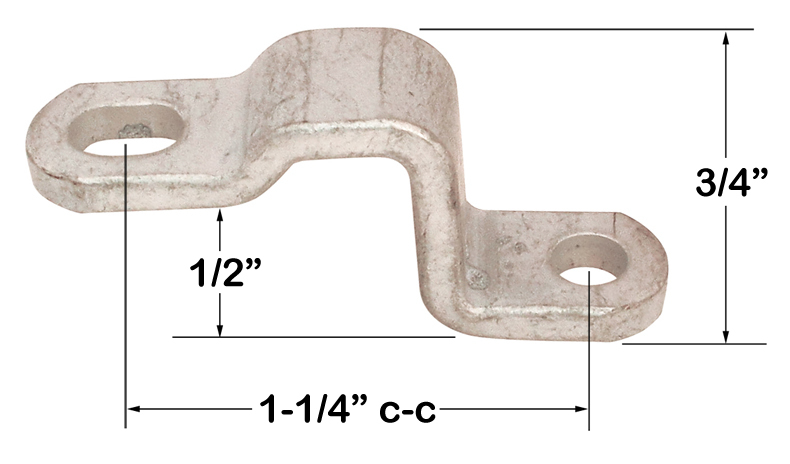 U bracket: 10-3/4" x 2-1/4" x 1-7/8". Stand-off: 3" x 27-3/8". 1/8" galvanized steel. 7.2 lbs. Commscope universal tower leg stand-off face bracket. Heavy galvanized steel. Works with any tower leg from 3/4" to 2" diameter. U bracket: 2-1/4" x 1-7/8" x 10-3/4". Stand-off: 2-1/4" x 14-7/8". 1/8" galvanized steel. 5.8 lbs. Commscope universal tower leg stand-off bracket. Heavy galvanized steel. 60º, 90º and round legs. 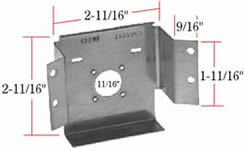 U brackets: 2-1/4" x 1-7/8" x 13-7/8"L. Stand-off: 2-1/4" x 13-7/8". 1/8" galvanized steel. 7.25 lbs. Commscope universal tower leg stand-off bracket. Heavy galvanized steel. U brackets: 2-1/4" x 1-7/8" x 13-7/8"L. Stand-off: 3" x 27-3/8". 1/8" galvanized steel. 8.6 lbs. Mounting brackets for jacks. (2) holes 1-1/32" dia. & 7/16" dia. 4-3/8"L, 1-3/4" x 2" legs. 1/4" mounting holes, 1-1/8" c-c.
Navy gun support. Solid aluminum gun mount, 11-7/8" diameter semi-circle. NSN: 8140-00-421-4366. Aluminum support arm. 8"L x 1/2"W x 31/32"H. Two predrilled holes 1-3/16" c-c. Removed. Bracket is flexible for molding to pole or rounded surface. 11/16" opening for RF connector. Chrome plated. 1-1/2" pipe bracket. Cast aluminum. Perfect for 1-1/2" black or galvanized pipe. 3 mounting holes 3" c-c x 3/8" diameter. 1.92" inner diameter x 2-1/2" deep. Solid aluminum support - finish piece. 8-32 hole on each end. Top half is painted gray. 3/8" x 5/8" x 11-3/4" long. Aluminum angle bracket. 4 x 2 threaded inserts (6-32). 0.090" thick. 1" x 1" x 16-3/8". Heavy steel mounting platform. Olive drab. 12" x 16", 1" return for standoff. Fan support panel. Made for SRS transceiver SR380. Fan mounting posts (8-32) 2.815" c-c. Black anodized. 3-3/4" x 10-1/2". 1" return. New!! Solid copper plate. Various electronic holes. Fits certain 4x4 electrical boxes. 4" x 4" x 1/32" thick. Harris P/N: 358-1348-000. Cover plate. Aluminum - chromate. 4.615" square. Corner holes 4.115" c-c. 0.065" thick. 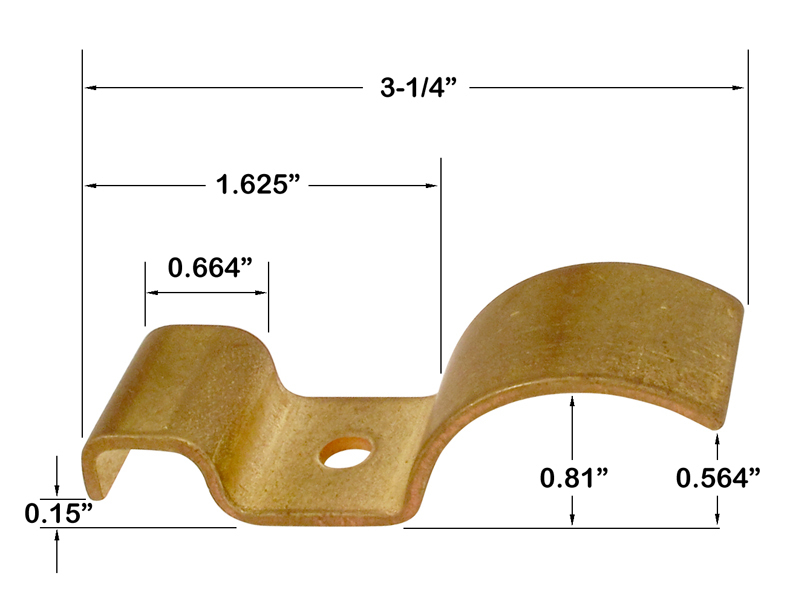 Solid brass mounting bracket. 0.1" thick, 1/4" mounting hole. Mounting base or opening cover. White enamel. 3-1/4" x 3-1/4" x 1/16". Four mounting studs (8-32 x 1/4"). 2-1/4" c-c. Mounting bracket / heatsink. Aluminum. Three 4 - 40 threaded studs. 1/2" x 7/8" foot with 2 pressed 4 - 40 nuts. 0.887"W x 2.414" x 0.062" thick. NSN: 5999-01-113-5406. Plate clamp. Olive drab. 5/8" diameter hole. Measures 3-1/4" length, 2-1/2" width, 1/2" high. Measures 4" diagaonally. NSN: 5805-392-7670. Uni-Strut universal right angle surface bracket. 1/4" plate steel construction. 9/16" diameter holes. 3-3/4" high. 5-1/4" x 5-1/4". Army green and galvanized randomly supplied. New old stock, some corrosion. Limited quantities! Aluminum angle bracket. Building block. 3 threaded inserts. 2.281" x 0.843" x 0.621". Angle bracket. 45º angle. Chromate aluminum. 14 gauge (0.064") thick. 3-3/4" base leg, 2-7/8"L mounting surface @ 45º angle, 3-1/4" high base to top of angle. Robust aluminum heatsink / bracket. 3/4" high, 1/2" inner height. 1-1/4" c-c mounting holes. NSN: 5999-01-207-6415. Shelf bracket. 5"L x 3/4" x 1". 1/4"D holes, 2-1/4" c-c. 0.064" thick, 14 gauge.